Falvey Memorial Library :: What’s that New Desk for in The Learning Commons? What’s that New Desk for in The Learning Commons? 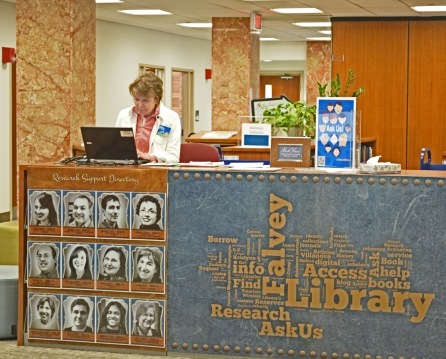 The new Learning Commons Service Desk has opened on Falvey’s second floor. The Library has recognized the need for a service point in the Learning Commons to help library patrons locate resources, people and places. Falvey’s Information and Research Assistance team, whose mission is “to serve the Villanova community by connecting members and visitors with the resources necessary to achieve their learning and research goals while developing their information-seeking skills,” has assigned two of its team members to staff this new desk. And get you answers for your questions. Photo taken by Alice Bampton, digital image specialist and senior writer on the Communication and Service Promotion team.